Google is finally taking steps to ensure that its rapid development in the field of AI will only bring about positive change for the whole of humanity. London-based company DeepMind, a subsidiary of Google parent firm Alphabet, has formed a new research unit called “Ethics & Society,” tasked to steer the group’s AI efforts. “Our intention is always to promote research that ensures AI works for all,” DeepMind explains in a blog post. Promising to “help technologists put ethics into practice,” DeepMind Ethics & Society group outlined the principles that will guide its future endeavors: social benefit, being rigorous and evidence-based, transparency and diversity. The group is comprised of thinkers and experts from a variety of disciplines. They include Nick Bostrom (Oxford University philosopher), Diane Coyle (economist from University of Manchester), Edward W. Felten (computer scientist from Princeton University) and Christiana Figueres (Mission 2020 convener) to name a few, Gizmodo reported. The group lists some of the key issues it will address including AI risk management, setting up standards of AI morality and values as well as lessening the economic disruption AI will likely bring when it replaces real people in the workforce. It still remains to be seen just how persuasive DeepMind Ethics & Society will be in terms of imposing its recommendations on Google’s AI ambitions. A clash between the two groups is likely to happen in the future considering that Google’s thrust of churning out potentially profitable AI-powered products may run counter to the Ethics & Society’s goals and principles. The rapid development of artificial intelligence is a rather divisive issue even among industry titans. One of the most vocal opponents of unregulated research on AI is Tesla CEO Elon Musk who view artificial intelligence as a potential threat to mankind, calling for a proactive stance in its regulation. The post Google's DeepMind Starts Ethics Group to Examine AI's Impact on Society appeared first on WebProNews. In what is being touted as the “Olympics of the corporate world,” Amazon has set off a ferocious bidding war among North American cities to host the online retailer’s second headquarters. While deals of this kind are usually done behind the scenes, Amazon has publicly solicited bids from cities to become the location of its second home, dubbed as “HQ2.” As a result, cities are now trying their best to outdo each other to come up with enough enticing perks to woo the internet firm. And it’s not hard to understand why cities would be motivated to bag Amazon’s HQ2. Aside from the prestige of having one of the world’s largest firms, the chosen city’s economy would receive a giant boost from the $ 5 billion Amazon intends to invest in the project. But that’s not all. The biggest impact would come from the high-paying jobs that Amazon’s second headquarters will create. According to the company’s solicitation, it plans to hire around 50,000 full-time employees for the new location with annual salary projected to be in the $ 100,000 range. With a month to go before the October 19, 2017, deadline, the list of cities vying for Amazon’s HQ2 has ballooned to over 100. Currently, the top contenders include Austin, Boston, Chicago, Denver, New York, Toronto, and Ottawa. 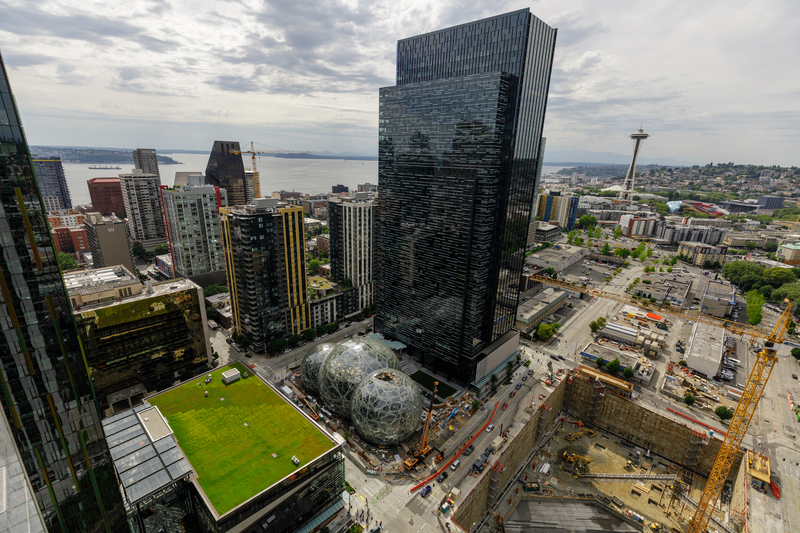 Amazon has revealed some requirements for a city to qualify as a possible second headquarter location. For instance, the company prefers a metro area with over a million in population. Accessibility for transportation and communication are also important as the company requires that a city should be close to an international airport, with a mass transit system in place, must be located near a major highway and must have good internet access. But not everyone is very optimistic about the prospect of living next door to a global behemoth. One major concern is that the swarm of high-paying Amazon workers will eventually wreak havoc on the local standard of living, driving up the cost of housing and exerting an upward force on wages which is bad for local businesses, according to Globe columnist Evan Horowitz as quoted by Business Insider. The post Amazon Plans to Open Second Headquarters, Starts Bidding War Among 100 Cities appeared first on WebProNews. The announcement came just over a month after the social media site clamped down on fake news and disinformation. “With this update, we reviewed hundreds of thousands of web pages linked to from Facebook to identify those that contain little substantive content and have a large number of disruptive, shocking or malicious ads,” the blog post, written by Jiun-Ren Lin and Shengbo Guo, said. This is not a new policy, of course, as engineers at the social media site have been trying to weed out low quality or “disruptive” content from its pages since last year. Tabloid-style headlines, deceptive ads, sexual images, and shocking content are either pushed back down in the feeds or erased altogether. Facebook utilized machine learning to study the blueprint and models used by spammy ads. With the new algorithm in hand, its AI systems then comb through the billions of posts to find similar patterns. One of the reasons for Facebook’s aggressive approach toward spammy ads, fake news, and disruptive content was the blowback that Mark Zuckerberg received from critics who accused the social media company of influencing the U.S. elections last November. Zuckerberg initially hedged, but immediately introduced measures to insulate the platform from being a harbinger of fake news and disinformation. In February, the billionaire released a manifesto where he reiterated the company’s original vision of building a community to bring the world closer together. In this manifesto, he revealed that they were working on machine learning to flag videos and photos that are deemed to be controversial. The Facebook team will then review the content before allowing it to be seen on users’ news feeds. “Today I want to focus on the most important question of all: Are we building the world we all want?” Zuckerberg wrote. Are there pop-up ads on the landing pages? Are the ads shocking or sexual? Marra said their algorithms will skip over some ads if they are “high-quality” enough that people wouldn’t mind seeing them when they do click on a sponsored content in their news feeds. The post After Fake News, Facebook Starts Crackdown on Spammy Ads appeared first on WebProNews. The post Cory Huff: Shakespearian Actor Starts A Blog To Teach Creative People How To Sell Their Art Online And Today Makes $ 180,000+ A Year Online appeared first on Entrepreneurs-Journey.com. The post Joanna Penn: Creative Writer Breaks Free From A Job She Hated, Starts A Blog, And Today Makes $ 100,000+ As A Best Selling Crime Thriller Author And Mentor To Writers appeared first on Entrepreneurs-Journey.com.